This is a small add-on pack for Glimmar's Steampunk v19+ with MC 1.13+. It converts redstone dust crystal trails that are standard now in the GS pack back into copper pipes that more appropriately fit the theme of 'retro-tech'. Minecraft 1.9 onwards made it impossible to have redstone dust copper pipes without all the pipes having a hard-wired red glow. 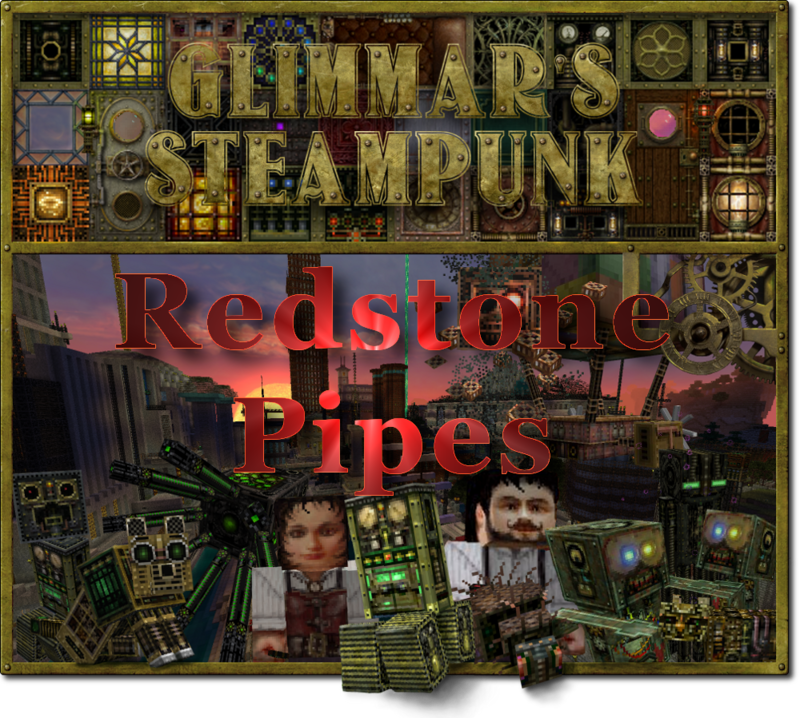 This add-on pack addresses this issue and allows users of Glimmar's Steampunk to have the once familiar copper pipe texture back in their world builds. This add-on is specific to Glimmar's Steampunk and must not be redistributed in or with any other resource pack (see licence details below), however for personal use only, users of other texture packs may find it of interest too! 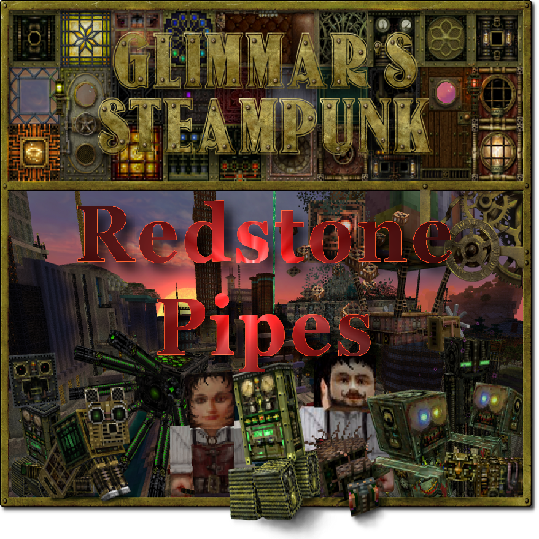 Please note: The Glimmar's Steampunk Redstone Pipes add-on pack is not compatible with pre-MC 1.13 texture packs or Glimmar's Steampunk v18 and earlier. If there is sufficient demand I may be able to provide a version that will work with earlier versions of Minecraft. Minecraft 1.13 brought many profound changes that make backwards compatibility impossible. Just like with any other resource pack, drop the GS Redstone Pipes add-on pack into your Minecraft resource pack folder and drag it over into the Selected Resource Packs column, but make sure it is always above the Glimmar's Steampunk v19+ or preferred resource pack otherwise it will not show up ingame. All users of Glimmar's Steampunk, past and present, should know that redistribution of my textures and art assets within or without this Curse/Forge official page and my official Minecraftforum.net "Glimmar's Steampunk" thread, is strictly forbidden. You are free to edit this pack for personal use, or make videos and reviews, show screens, etc. with proper credit and links back to my Minecraft Forums thread, but you must not re-post any of my packs, textures or art assets online outside of my official pages here or on Minecraftforum.net as they are copyright.